Elise May is an actor, singer, storyteller and Teaching Artist who has performed and taught in the U.S., Canada, Bermuda and England for over twenty-five years. 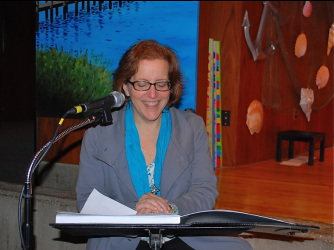 With undergraduate degrees in Theatre and Dance, as well as Communicative Disorders and Sciences, and a graduate degree in Theatre and Voice, Elise has developed many educational programs focused on achieving vocal empowerment through theatre arts. As a teacher, Elise’s experiences range from the prestigious Rose Bruford School of Speech and Drama in London, to SUNY Buffalo, to working in NYC with actors on how to change their accents. As a performer her experience includes acting in Shakespeare in Delaware Park, singing Jacques Brel in Newfoundland and performing radio dramas at Hillwood Recital Hall with WCWP radio. After starting a family, Elise became impassioned with keeping arts education alive in the public school system. As a Teaching Artist, Elise has worked with teachers to create interactive, multi-sensory programs with curricular connections. From enacting classic literature to creating new performance pieces, Elise focuses on the quality of learning achieved through understanding process and accessing multiple intelligences. All of her programs, Storytime Theater, Expressive Elocution, Multicultural Voices, and more, have successfully been in mainstream, Special Education and ESL classrooms. With the support of SEPTA and the Port Washington Public Library, Elise developed Creative Readers, an arts education program for students with special needs. Elise has presented at the Balanced Mind Conference, the Annual Conference of the Bermuda Union of Teachers, NYSTEA Educator and Student Conferences as well as to school administrators, teachers and parents. She is a multi-year grant recipient and has received support from the Ed. Foundation, NYSCA, EEAC, HAC, JP Morgan Chase and NYSED. Elise is married with three beautiful children who love working in the theater!